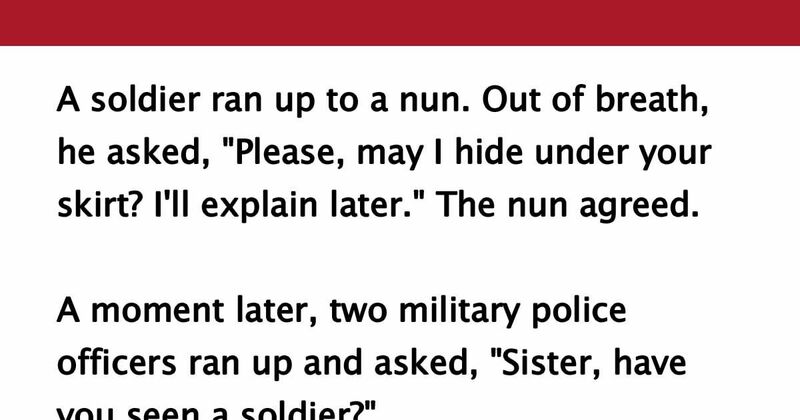 A soldier ran up to a nun. Out of breath, he asked, "Please, may I hide under your skirt? I'll explain later." The nun agreed. A moment later, two military police officers ran up and asked, "Sister, have you seen a soldier?" The nun pointed down a street and replied, "He went that way." After the officers ran off, the soldier crawled out from under her skirt and said, "I can't thank you enough, sister. You see, I don't want to go to Syria." "I understand completely," the nun replied. The soldier added, "I hope I'm not being too rude, but you have a great pair of legs!" The nun replied, "If you had looked a little higher, you would have seen a completely different pair... I don't want to go to Syria either." Oh my! SHARE this funny story with your friends!